Corporate Gift Boxes supplied by Pack Now. We supply the widest range of corporate gift boxes. Our corporate gift boxes come in two colour options brown and white. The white corporate gift boxes are slightly more expensive than the brown boxes. We generally hold, stock of our most popular line items but please check with our sales team for stock availability for an item of your choice. We sell corporate gift boxes in any quantity, purchase one or one hundred and we will be happy to assist in sales. We also offer bulk or wholesale prices on our corporate gift boxes. We can also manufacture custom corporate gift boxes to your spec, please contact our sales team on Tel +27 31 563 2866 for more information. Dimensions : 310 x 210 x 65 (L x W x H) Thickness: Single wall Qty: Sold as singles/ in bulk Colour: Kraft This gift box is a Die Cut box also available in white. Dimensions : 150x 100 x 50 (L x W x H) Thickness: Single wall, E flute Qty: Sold as singles Colour: Brown The Invitation Box is the perfect box for invitations and other gifts. 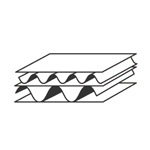 The box is supplied in two parts as a lid and base. The lid is detachable by pulling upwards. The boxes are supplied in flat pack form. Dimensions : 300 x 120 x 75 (L x W x H) Thickness: Single wall Qty: Sold as singles/ in bulk Colour: White This is a gift box also available in brown. Dimensions : 150 x 150 x 80 (L x W x H) Thickness: Single wall Qty: Sold as singles/ in bulk Colour: White This is a gift box also available in Kraft. Dimensions : 220 x 220 x 50 (L x W x H) Thickness: Single wall Qty: Sold as singles/ in bulk Colour: Kraft This gift box is a Die Cut box also available in white. Dimensions : 100 x 100 x 40 (L x W x H) Thickness: Single wall Qty: Sold as singles/ in bulk Colour: Kraft This gift box is a Die Cut box also available in White. Dimensions : 320 x 210 x 110 (L x W x H) Thickness: Single wall Qty: Sold as singles/ in bulk Colour: Kraft This gift box is a Die Cut box also available in White. Dimensions : 205 x 130 x 60 (L x W x H) Thickness: Single wall Qty: Sold as singles/ in bulk Colour: White This is a gift box also available in Kraft. Dimensions : 140 x 105 x 65 (L x W x H) Thickness: Single wall Qty: Sold as singles/ in bulk Colour: Brown/craft This is a gift box also available in white. Dimensions : 290 x 145 x 50 (L x W x H) Thickness: Single wall Qty: Sold as singles/ in bulk Colour: Kraft/Brown This is a gift box also available in white. Dimensions : 300 x 220 x 300 (L x W x H) Thickness: Single wall Qty: Single units can be purchased, bulk pricing applies call us. Colour: White This is a gift box. Dimensions : 85 x 75 x 37 (L x W x H) Thickness: Single wall Qty: Sold as singles/ in bulk Colour: White This gift box is a Die Cut box. Dimensions : 110 x 110 x 153 (L x W x H) Thickness: Single wall Qty: Sold as singles/ in bulk Colour: White Mug Box This gift box is a Die Cut box also available in Kraft. Dimensions : 155 x 140 x 40 (L x W x H) Thickness: Single wall Qty: Sold as singles/ in bulk Colour: White This gift box is a Die Cut box also available in Kraft. Dimensions : 220 x 220 x 50 (L x W x H) Thickness: Single wall Qty: Sold as singles/ in bulk Colour: White This gift box is a Die Cut box Lid & Base Self Lock also available in Kraft. Dimensions : 120 x 120 x 170mm (L x W x H) Thickness: Single wall Qty: Sold as singles/ in bulk Colour: White This gift box is a Die Cut box. Dimensions : 200 x 140 x 40 (L x W x H) Thickness: Single wall Qty: Sold as singles/ in bulk Colour: White This gift box is a Die Cut box also available in brown.